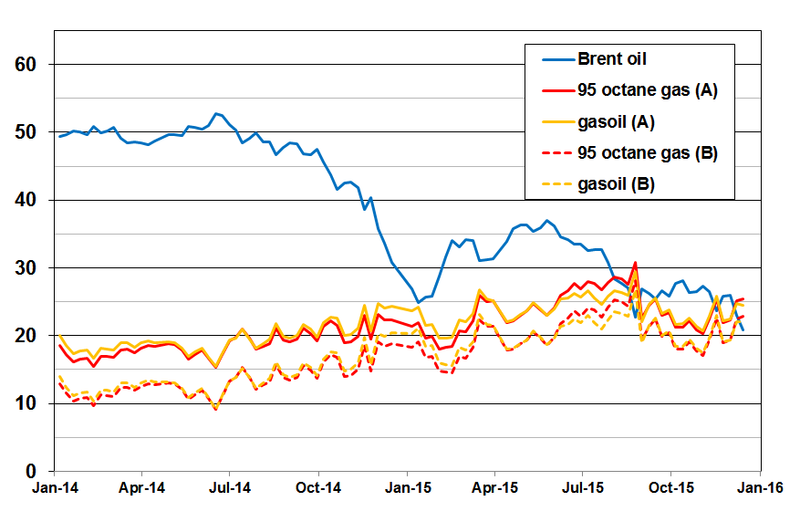 Price = oil cost + other costs + taxes + margin. 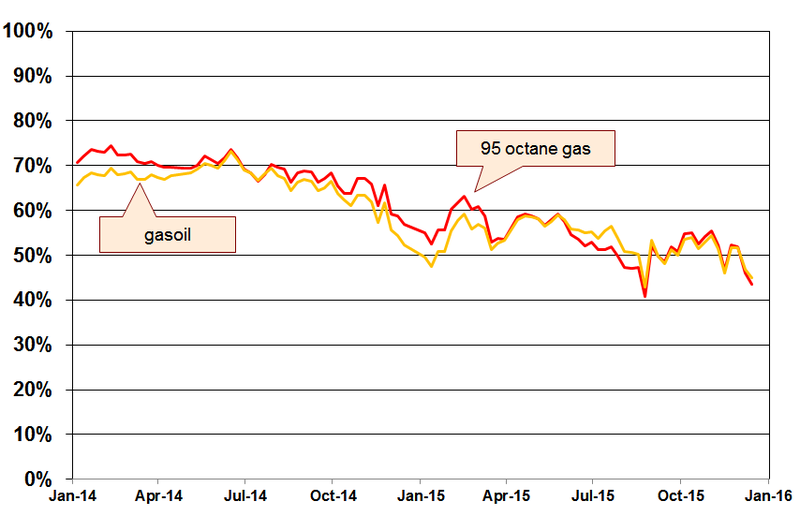 Short-term, margin fluctuations are countercyclical to oil price. This might be due to an effort from companies to stabilize prices. 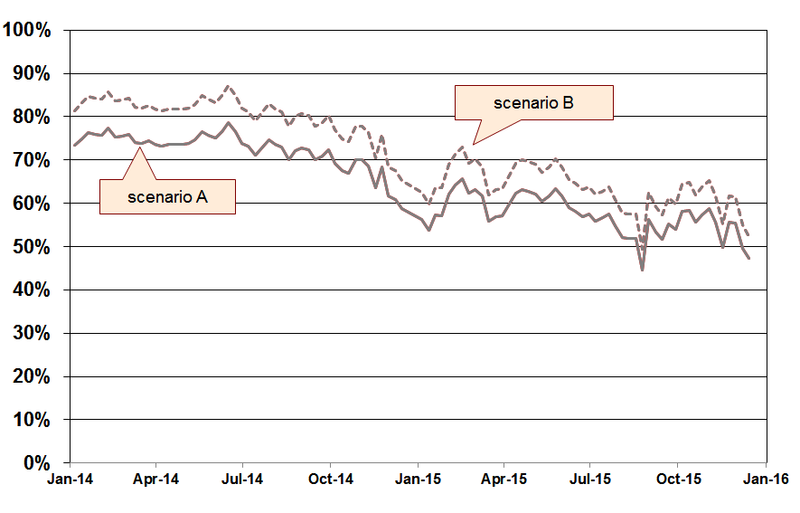 In the two-year period studied, margins grow very much, around 30% for scenario A and 60% for scenario B. This trend has been somewhat corrected in the second half of 2015, though. The percentual contribution of oil costs to fuel prices (which is by virtue of the cost allocation model exactly the same for gasoline and gas) drops in 2014-15 from 75% to 55% (scenario A) and from 85% to 60% (scenario B). 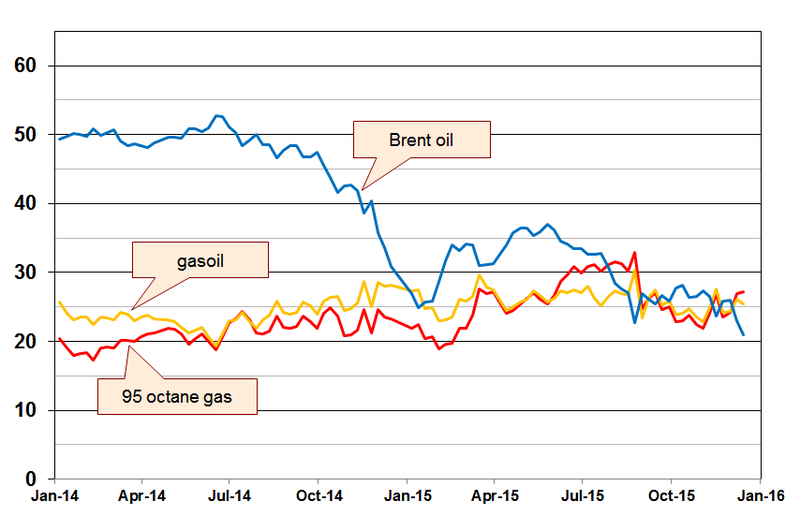 The figure shows the weekly evolution during 2015 of prices of Brent oil and average retail prices without taxes of 95 octane gas and gasoil in Spain, all in c€ per liter. ΔBrent ≤ 0 → y = f−(x) = b− + m−x = 0.3552 + 0.4040x. 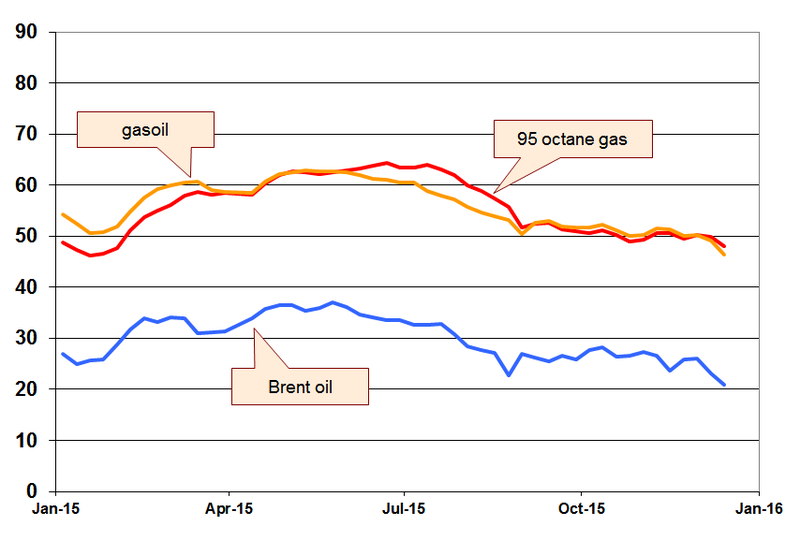 Due to the outlier in the right lower corner (with date August 31), positive variations in oil price don't translate, in average, as positive increments in the price of gasoline. 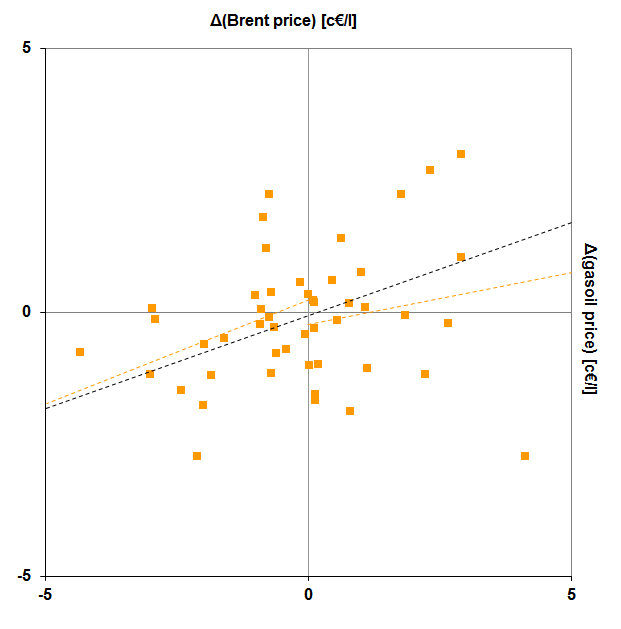 The most worrisome aspect is the fact that b+ and are b− positive, which suggests an underlying trend to increase prices when oil is stable. ΔBrent ≤ 0 → y = f−(x) = b− + m−x = 0.2468 + 0.3956x. Again, no "rocket and feather" effect here (in fact, m+ is slightly smaller than m−). 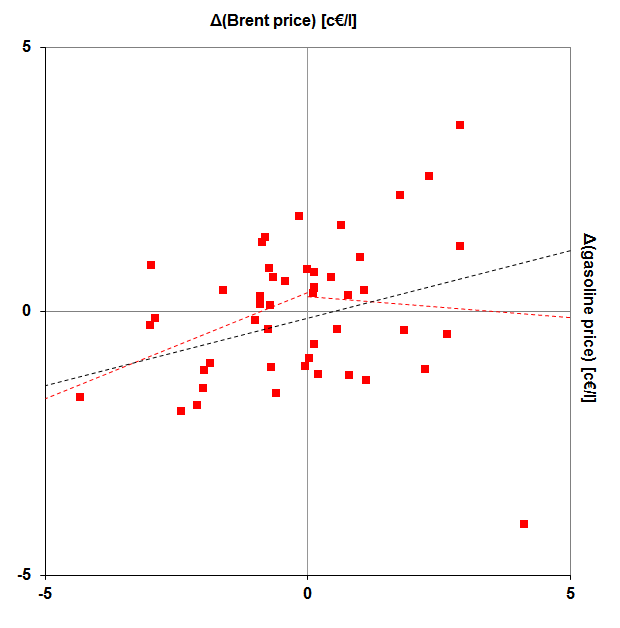 Variations around ΔBrent = 0 are fairly symmetrical and, seemingly, fair.